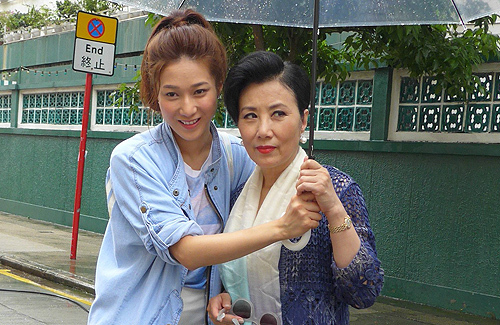 Linda Chung (鍾嘉欣) and Alex Fong (方力申) were spotted filming under the blaring heat for TVB drama Elegant Transformation <華麗轉身>earlier. With filming taking place during the height of Hong Kong’s unforgiving hot and humid summers, the cast sought ways to ease their discomfort beneath their layered costumes. Although it was fairly hot, Alex wore a gray suit, causing him to sweat profusely during the entire scene. On the other hand, Linda wore a short skirt, enjoying the cool breeze as she politely waved and smiled at the reporters during their break. Standing at a rather high angle, Linda almost accidentally exposed herself to pedestrians. Fortunately, the production crew had reflectors to help shield Linda from any onlookers with cameras. Although Alex was a bit lethargic due to the heat, he still enjoyed the filming process. Alex had to undergo extensive fitness training earlier for an underwear commercial earlier, forcing him to cut out a lot of fatty food from his diet and add muscle. Since his commercial is done, Alex finally got a chance to eat fries in his date scene with Linda. Earlier, the cast of Elegant Transformation filmed a beautiful scene on a cruise ship. Seizing the opportunity, Liza Wang (汪明荃) took pictures with Damien Lau (劉松仁), Alex, Cheung Kwok Keung (張國強) and other cast members before posting them on her Weibo account. Liza made herbal tea for the cast and even referred to Linda as Linda BB– indicating their easygoing relationship although they have rarely worked together. and hope is going to be a good FILM! ! ! ! ! LOL my…what ugly hair on both Linda and Liza! Looking forward to the drama. Hmmm, whatever happened to the drama with Harwick Lau playing the son of Liza Wang?